This is a view I’ve seen a number of times but wasn’t ever sure how to capture it until yesterday. I’ve always had the wrong camera with me, either from the focal length, the aspect ratio, or both, perspective. This is an outtake in the sense that I was doing a model shoot with a friend of mine on the pier of the old C&O Canal bridge that used to cross the Potomac River in Georgetown, so taking this photo was not the purpose of the shoot. This is the view looking straight down at the dock for the boathouse. 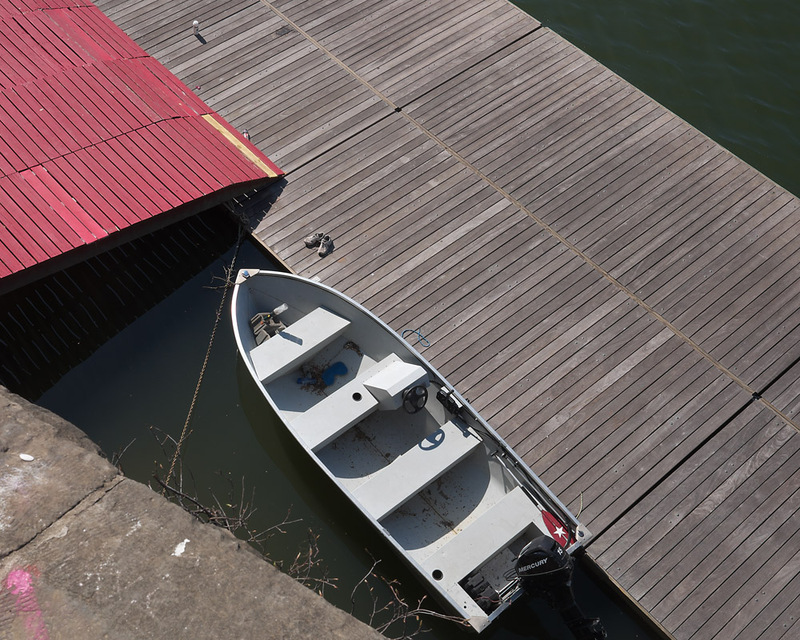 I was particularly drawn to the geometry and angles formed by the decking on the boat dock, with the red decking running perpendicular to the unpainted deck, and all the triangles formed by the perspective you have to take to see the scene in the first place. Even the boat, which has a totally different shape and texture to the decking, creates more triangles with its prow, and provides visual tension running the opposite direction so you move your eye around the image.